Before I go any further with this post, I've got to admit that I'm really not much of a baker. Baking tends to be a little bit too precise for me...however, the more I delve into testing out some baking projects, the more I enjoy the experimentation! I'd made these pop tarts several times at my old place only to bake them to share with my friends pre-marathon and somehow ruin an entire batch...I had to go through a bit of trial and error to figure out where I'd gone wrong, but I finally figured it out...which is why I've decided to blog it here. This way I'll always be able to revert back to this recipe and no more fails will happen!! I was a pretty big pop tart eater back in my elementary school days. My mom would pack them in my school lunches nearly every single day in lieu of a sandwich because I wouldn’t eat the bread…instead I’d eat the deli meat and leave the bread somewhere to get moldy and gross. Anyone who knows me now probably can’t even imagine a version of Katie who wouldn’t eat bread, but that was the situation back then. In order to be sure that I ate more than just a couple of slices of ham, my mom sent me to school with a pop tart zipped up into a plastic sandwich baggie as though it were the most normal thing in the world. This was the 90s though...I think lots of questionable food choices were made by parents of elementary school-aged kids back then. Kids today eat so much more healthy...I don't remember any kids ever bringing vegetables to school back then! 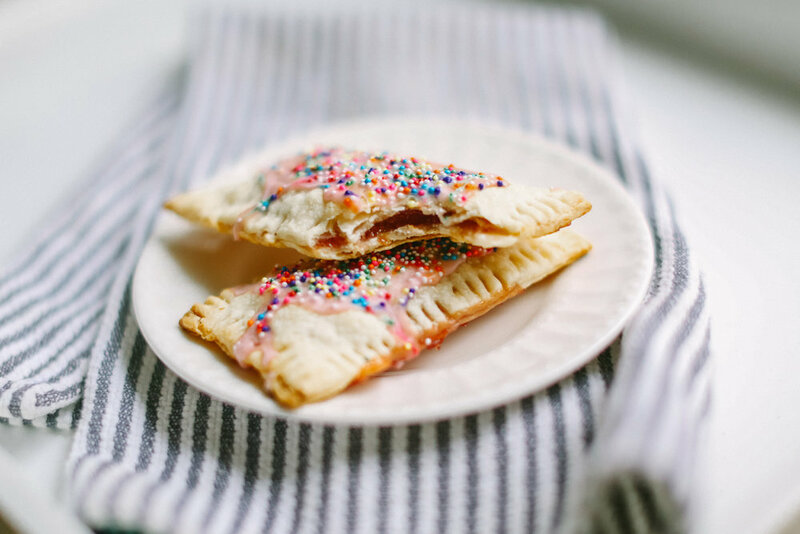 Kids today eat so healthy that I think a parent sending a kid to school with a pop tart for lunch might possibly raise some kind of red flags...I can't say for sure though since I don't have kids to feed pop tarts to. Just a cat, and cats do NOT enjoy pop tarts. 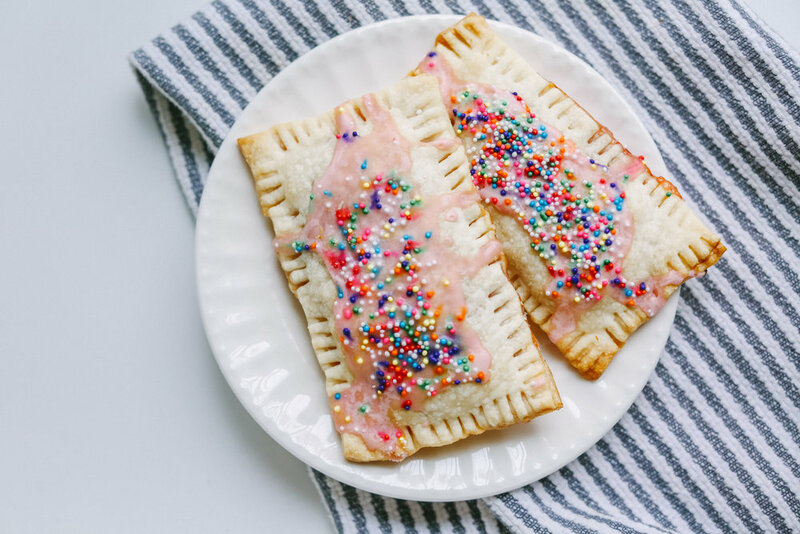 Although I don’t eat pop tarts every day as an adult, I do have a soft spot for them and I try to incorporate them into my pre-workout snack routine when appropriate and necessary…which is usually before a long run or a PR attempt! I ate two pop tarts before beginning my most recent marathon and I feel like they helped fuel me to PR by 44 minutes! Bring your pie crust dough to room temperature and lay one sheet on top of the other. Using a pizza cutter, cut a large square out of the dough layers. Cut individual pop tarts out of the large square. Add peanut butter and jam fillings to the center of one piece of the pop tart’s dough. Use a silicone brush to brush the beaten egg along the edges of the other side of the pop tart to help the pieces stick together. Seal the edges together and then use a fork to crimp the edges. With the tines of your fork, prick a few holes in the top of the pop tart to vent. Bake on a parchment paper lined baking sheet for 8-10 minutes or until slightly golden brown. Transfer to a cooling rack once finished. Mix the tiniest amount of milk possible into your powdered sugar to create a thick glaze. I’ve actually used a teeny bit of french vanilla coconut milk creamer when I was out of milk and it turned out really well! Feel free to use whatever type of milk you like. Add a drop or two of your favorite food coloring and whisk til the glaze is thick and smooth. Use a spatula to add to the tops of your pop tarts once they’ve cooled.